With Nick and Eve trapped inside another dimension, their friends must find a way to bring them back. At the beginning of Grimm 6×11, Nick comes back home late at night and finds Adalind still awake. They talk about how Renard demanded Nick tell him what’s happening with the symbols Diana was able to see in the tunnel. Adalind reveals to Nick how Diana made Renard kill Bonaparte the night Nick had the infamous confrontation with Black Claw in his loft. She also tells him about how she killed Rachel Wood. Adalind thinks it would be better to involve Renard in what is going on if Diana is truly in danger. Shortly after his conversation with Adalind, Nick receives a phone call from Monroe. He and Rosalee discovered what Eve did – how she went through the mirror using Blood Magic to try and catch the skull monster. On the other side of the mirror, Eve wakes up in what appears to be a forest. It’s snowing, and she is surrounded by rocks. One of them has the function of a mirror, allowing her to see what happens inside Monroe and Rosalee’s house. She tries to call them, but they can’t see her. Suddenly, the mirror disappears. The rock is back being just a rock, but on it, we can see the symbols we now know so well. Suddenly, Eve hears a scream coming from another part of the forest. She runs towards the noise and finds a man fighting what appears to be three wesen. One is injured, but the other two manage to kill the man. Meanwhile, Nick, Adalind, Diana and her little brother arrive at Monroe and Rosalee’s. While Nick and Adalind try to figure out what happened to Eve, Diana looks at the mirror and says that Eve is in there. They figure only another Hexenbiest could follow Eve through the mirror, since the Blood Magic spell only works with a Hexenbiest, but Nick won’t let Adalind risk her life. They must try something else, so Nick thinks about the magical stick. It works: The stick allows Nick to open another portal through the mirror, but it falls from his hand as he goes through. Diana explains that Nick couldn’t bring the stick with him because it doesn’t belong to that other dimension. Once again, as happened with Eve, Nick wakes up in the middle of a forest. He sees his friends through the rock-mirror, but they can’t see him. Nick hears the same noises and sees a scene similar to the one Eve saw – only this time, the wesen see him and attack him. Eve finds him and asks him if he recognizes the place they are in. Nick admits the forest looks a lot like the Black Forest in Germany, where he and Monroe found the magical stick. Nick and Eve have a confrontation. Nick tells her she shouldn’t have crossed the mirror alone, that she doesn’t owe anything to anybody. Back in Portland, Adalind suggests Monroe and Rosalee should ask for Renard’s help. They have run out of options. As Grimm 6×11 continues, Nick and Eve are still trying to figure out where they are. Suddenly, Eve notices that she is starting to woge, even though she doesn’t want to. Other wesen are running after them. Back at Nick’s loft, Hank and Wu are called in to be updated on everything that happened. Renard joins them, so Adalind proceeds to show him the tunnel and the symbols. In the forest, while Nick and Eve are trying to run away from the wesen that are chasing them, they stumble upon a sort of village. It’s not a wesen one, luckily. The inhabitants all seem to be human, and very scared. Nick kills the wesen in front of them, so they let him and Eve inside their village. Communication is difficult since they only speak German, but Nick tries to explain that he and Eve are looking for the skull monster. He draws its face on a rock, and the people immediately recognize it: They call it Zerstoerer and say it’s in the Black Forest. So Eve and Nick really are in the Black Forest – they have come full circle. In Portland, our friends are updating Renard on everything they have found out so far. They show him the cloth with the symbols Eve carved in the tunnel’s walls, as well as the stick, and they explain what that tiny piece of wood can do. Renard is stupefied. He promises he’s going to ask the help of a friend who might know more about the meaning of the symbols. Back in the Black Forest of the other dimension, Nick and Eve are brought exactly where they came from, near the rocks where they woke up. The leader of the village explains to them that the Zerstoerer is there. In Portland, Renard calls his friend. She explains that the dimension where Nick and Eve are could be considered as a pre-life or an afterlife. It is very dangerous to cross another dimension, obviously. When Diana mentions that there is a scary monster who lives in that dimension, and Adalind explains about the skull monster, Renard’s friend seems to know what they are talking about. She looks scared. She talks in Russian to Renard so that the others can’t understand and says Diana could be the Shaphat. The skull monster could be what we call the devil, and there are a lot of prophecies that predict its coming. This devil will take a Shaphat and make her his bride. So Skullface wants Diana as his wife – a child bride. Renard explains to the group what his friend just told him. They decide to act immediately and split up. Adalind, Renard, and the kids will go to Monroe’s house with him; Wu, Hank, and Rosalee will go to the spice shop to see if they can find something useful in the books there. In the Black Forest, Nick tries to convince Eve that she doesn’t have to sacrifice herself for something that it’s his fault. He brought her to be the way she is now. Eve says that she is not Juliette anymore, and that person is gone now. She says she feels she has a strength and a purpose she never had before. She also admits that for her, happiness just gets in the way. Nick shouldn’t feel responsible for her anymore, and everything that happened happened for a reason. Them being together in this very moment means she can’t kill a Zerstoerer alone – she will need his help. Finally, Nick and Eve are face to face with the Zerstoerer. What’s going to happen now? Will Nick and Eve survive the confrontation with the devil? 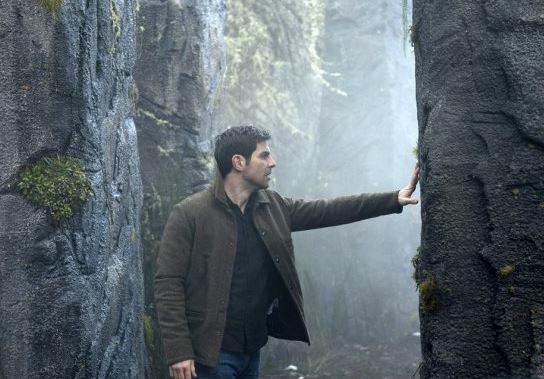 What did you think of Grimm 6×11, “Where the Wild Things Were”?